The Royal Collection of the British Royal family is the largest private art collection in the world. Spread among 13 occupied and historic royal residences in the United Kingdom, the collection is owned by Elizabeth II and overseen by the Royal Collection Trust. The Queen owns some of the collection in right of the Crown and some as a private individual. It is made up of over one million objects, including 7,000 paintings, over 150,000 works on paper, this including 30,000 watercolours and drawings, and about 450,000 photographs, as well as tapestries, furniture, ceramics, textiles, carriages, weapons, armour, jewellery, clocks, musical instruments, tableware, plants, manuscripts, books, and sculptures. Few items from before Henry VIII survive. The most important additions were made by Charles I, a passionate collector of Italian paintings and a major patron of Van Dyck and other Flemish artists. He purchased the bulk of the Gonzaga collection from the Duchy of Mantua. The entire Royal Collection, which included 1,500 paintings and 500 statues, was sold after Charles's execution in 1649. The 'Sale of the Late King's Goods' at Somerset House raised £185,000 for the English Republic. Other items were given away in lieu of payment to settle the king's debts. A number of pieces were recovered by Charles II after the Restoration of the monarchy in 1660, and they form the basis for the collection today. The Dutch Republic also presented Charles with the Dutch Gift of 28 paintings, 12 sculptures, and a selection of furniture. He went on to buy many paintings and other works. Johannes Vermeer: The Music Lesson, c. 1660, was acquired by George III in 1762. George III was mainly responsible for forming the collection's outstanding holdings of Old Master drawings; large numbers of these, and many Venetian paintings including over 40 Canalettos, joined the collection when he bought the collection of Joseph "Consul Smith", which also included a large number of books. Many other drawings were bought from Alessandro Albani, cardinal and art dealer in Rome. George IV shared Charles I's enthusiasm for collecting, buying up large numbers of Dutch Golden Age paintings and their Flemish contemporaries. Like other English collectors, he took advantage of the great quantities of French decorative art on the London market after the French Revolution, and is mostly responsible for the collection's outstanding holdings of 18th-century French furniture and porcelain, especially Sèvres. He also bought much contemporary English silver, and many recent and contemporary English paintings. Queen Victoria and her husband Albert were keen collectors of contemporary and old master paintings. Many objects have been given from the collection to museums, especially by George III and Victoria and Albert. In particular, the King's Library formed by George III with the assistance of his librarian Frederick Augusta Barnard, consisting of 65,000 printed books, was given to the British Museum, now the British Library, where they remain as a distinct collection. He also donated the "Old Royal Library" of some 2,000 manuscripts, which are still segregated as the Royal manuscripts. The core of this collection was the purchase by James I of the related collections of Humphrey Llwyd, Lord Lumley, and the Earl of Arundel. Prince Albert's will requested the donation of a number of mostly early paintings to the National Gallery, London, which Queen Victoria fulfilled. Throughout the reign of Elizabeth II (1952–present), there have been significant additions to the collection through judicious purchases, bequests, and gifts from nation states and official bodies. Since 1952, approximately 2,500 works have been added to the Royal Collection. The Commonwealth is strongly represented in this manner: an example is 75 contemporary Canadian watercolours that entered the collection between 1985 and 2001 as a gift from the Canadian Society of Painters in Water Colour. Modern art acquired by Elizabeth II includes pieces by Sir Anish Kapoor and Andy Warhol. In 1987 a new department of the Royal Household was established to oversee the Royal Collection, and it was financed by the commercial activities of Royal Collection Enterprises, a limited company. Before then, it was maintained using the monarch's official income paid by the Civil List. Since 1993 the collection has been funded by entrance fees to Windsor Castle and Buckingham Palace. A computerised inventory of the collection was started in early 1991, and it was completed in December 1997. The full inventory is not available to the public, though catalogues of parts of the collection – especially paintings – have been published, and a searchable database on the Royal Collection website is increasingly comprehensive, with "265,302 items found" by early 2019. About a third of the 7,000 paintings in the collection are on view or stored at buildings in London which fall under the remit of the Historic Royal Palaces agency: the Tower of London, Hampton Court Palace, Kensington Palace, Banqueting House (Whitehall), and Kew Palace. The Jewel House and Martin Tower at the Tower of London also house the Crown Jewels. A rotating selection of art, furniture, jewellery, and other items considered to be of the highest quality is shown at the Queen's Gallery, a purpose-built exhibition centre near Buckingham Palace. Many objects are displayed in the palace itself, the state rooms of which are open to visitors for much of the year, as well as in Windsor Castle, Holyrood Palace in Edinburgh, the Royal Pavilion in Brighton, and Osborne House on the Isle of Wight. Some works are on long-term or permanent loan to museums and other places; the most famous of these are the Raphael Cartoons, in the Victoria and Albert Museum in London since 1865. The collection's holdings of Western fine art are among the largest and most important assemblages in existence, with works of the highest quality, and in many cases artists whose works cannot be fully understood without a study of the holdings contained within the Royal Collection. There are over 7,000 paintings, spread across the Royal residences and palaces. The collection does not claim to provide a comprehensive, chronological survey of Western fine art but it has been shaped by the individual tastes of kings, queens and their families over the last 500 years. Numbering over 300 items, the Royal Collection holds one of the greatest and most important collections of French furniture ever assembled. The collection is noted for its encyclopedic range as well as counting the greatest cabinet-makers of the Ancien Régime. British Bronze Age - the Rillaton Gold Cup, on long-term loan to the British Museum. Lely Venus, a Hellenistic statue of the "crouching Venus" type, bought by Charles I, on long-term loan to the British Museum. The collection has a number of items of clothing, including those worn by members of the Royal family, especially female members, some going back to the early 19th century. These include ceremonial dress and several wedding dresses, including that of Queen Victoria (1940). There are also servant's livery uniforms, and a number of exotic pieces presented over the years, going back to a "war coat" of Tipu Sultan (d. 1799). In recent years these have featured more prominently in displays and exhibitions, and are popular with the public. A collection of 277 cameos, intaglios, badges of insignia, snuffboxes and pieces of jewellery known as the Gems and Jewels are kept at Windsor Castle. Separate from Elizabeth II's jewels and the Crown Jewels, 24 pre-date the Renaissance and the rest were made in the 16th–19th centuries. In 1862, it was first shown publicly at the South Kensington Museum, now the Victoria and Albert Museum. Several objects were removed and others added in the second half of the Victorian period. An inventory of the collection was made in 1872, and a catalogue, Ancient and Modern Gems and Jewels in the Collection of Her Majesty The Queen, was published in 2008 by the Royal Collection Trust. The Royal Collection is privately owned, although some of the works are displayed in areas of palaces and other royal residences open to visitors for the public to enjoy. Some of the collection is owned by the monarch personally, and everything else is described as being held in trust by the monarch in right of the Crown. It is understood that works of art acquired by monarchs up to the death of Queen Victoria in 1901 are heirlooms which fall into the latter category. Items the British royal family acquired later, including official gifts, can be added to that part of the collection by a monarch at his or her discretion. Ambiguity surrounds the status of objects that have come into the possession of Elizabeth II during her reign. The Royal Collection Trust has confirmed that all pieces left to the Queen by the Queen Mother, which include works by Monet, Nash, and Fabergé, belong to her personally. It has also been confirmed that she owns the Royal stamp collection, inherited from her father George VI, as a private individual. Non-personal items are said to be inalienable as they can only be willed to the monarch's successor. The legal accuracy of this claim has never been substantiated in court. According to Cameron Cobbold, then Lord Chamberlain, speaking in 1971, minor items have occasionally been sold to help raise money for acquisitions, and duplicates of items are given away as presents within the Commonwealth. In 1995, Iain Sproat, then Secretary of State for National Heritage, told the House of Commons that selling objects was "entirely a matter for the Queen". In a 2000 television interview, the Duke of Edinburgh said that the Queen was "technically, perfectly at liberty to sell them". Hypothetical questions have been asked in Parliament about what should happen to the collection if the UK ever becomes a republic. In other European countries, the art collections of deposed monarchies usually have been taken into state ownership or become part of other national collections held in trust for the public's enjoyment. Under the European Convention on Human Rights, incorporated into British law in 1998, the monarch may have to be compensated for the loss of any assets held in right of the Crown unless he or she agreed to surrender them voluntarily. A registered charity, the Royal Collection Trust was set up in 1993 after the Windsor Castle fire with a mandate to conserve the works and enhance the public's appreciation and understanding of art. It employs around 500 staff and is one of the five departments of the Royal Household. Buildings do not come under its remit. In 2012, the team of curatorial staff numbered 29, and there were 32 conservationists. Income is raised by charging entrance fees to see the collection at various locations and selling books and merchandise to the public. The Trust is financially independent and receives no Government funding or public subsidy. A studio at Marlborough House is responsible for the conservation of furniture and decorative objects. ^ "The Adoration of the Kings". Royal Collection Trust. Inventory no. 406767. ^ "Venus and Adonis Embracing". Royal Collection Trust. Inventory no. 406050. ^ "The Flood". Royal Collection Trust. Inventory no. 406106. ^ "Diligence". Royal Collection Trust. Inventory no. 402941. ^ "Charles I with M. de St Antoine". Royal Collection Trust. Inventory no. 404552. ^ "Fame". Royal Collection Trust. Inventory no. 402942. ^ Stuart Jeffries (21 November 2002). "Kindness of strangers". The Guardian. Retrieved 15 July 2016. ^ Jerry Brotton (2 April 2006). "The great British art swindle". The Sunday Times. Archived from the original on 2 December 2016. Some people know that this is perhaps the finest, and certainly what the royal palaces website proudly calls "the largest private collection of art in the world". ^ a b "FAQs about the Royal Collection". Royal Collection Trust. Archived from the original on 4 April 2016. ^ "Secrets of the Queen's paintings". The Telegraph. 15 February 2015. Retrieved 21 March 2016. ^ "About the Collection: Photographs". Royal Collection Trust. Retrieved 4 March 2019. ^ Michael Prodger (22 January 2018). "The cavalier collector: how Charles I gained (and lost) some of the world's best art". New Statesman. Retrieved 4 March 2019. ^ a b c Michael Prodger (17 December 2017). "The Royals' Treasures". Culture. The Sunday Times. pp. 44–45. ^ "Lady at the Virginals with a Gentleman". Royal Collection Trust. Inventory no. 405346. ^ Sir Hugh Roberts in Roberts, pp. 25 and 391. 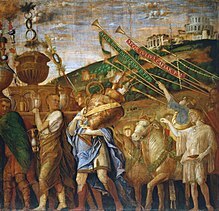 ^ "The Triumphs of Caesar: 4. The Vase-Bearers". Royal Collection Trust. Inventory no. 403961. ^ "Portrait of Jacopo Sannazaro". Royal Collection Trust. Inventory no. 407190. ^ "Works of Art". Parliamentary Debates (Hansard). 216. United Kingdom: House of Commons. 11 January 1993. col. 540W. ^ "Royal Collection". Parliamentary Debates (Hansard). 315. United Kingdom: House of Commons. 7 July 1998. col. 429W. ^ "Art Collections". Parliamentary Debates (Hansard). 219. United Kingdom: House of Commons. 19 February 1993. col. 366W. ^ a b "The convenient fiction of who owns priceless treasure". The Guardian. 30 May 2002. Retrieved 1 December 2016. ^ Clayton and Whitaker, pp. 12 and 16. ^ Jones, Jonathan (30 August 2006). "The real Da Vinci code". The Guardian. London. Retrieved 22 May 2010. ^ "The story of the Raphael Cartoons". V&A. Retrieved 12 February 2019. ^ Piacenti and Boardman, p. 11. ^ Lloyd, p. 11. "It is, therefore, a private collection, although its sheer size (some 7,000 pictures) and its display in palaces and royal residences (several of which are open to the public) give it a public dimension". ^ "Royal Taxation". Parliamentary Debates (Hansard). 351. United Kingdom: House of Commons. 7 June 2000. col. 273W. There is a computerised inventory of the Royal Collection which identifies assets held by the Queen as Sovereign and as a private individual. ^ "Force the Royal Family to declare gifts, say MPs". Evening Standard. London. 30 January 2007. Retrieved 26 November 2016. ^ a b Morton, p. 156. ^ "Ethiopian Manuscripts". Parliamentary Debates (Hansard). 263. United Kingdom: House of Commons. 19 July 1995. col. 1463W. ^ "Royal Finances". Parliamentary Debates (Hansard). 388. United Kingdom: House of Commons. 9 July 2002. col. 221WH. ^ "Working for us". Royal Collection Trust. Retrieved 21 March 2016. ^ "The Royal Collection: Not only for Queen, but also for country". The Telegraph. 28 May 2012. Retrieved 21 March 2016. ^ "Full accounts made up to 31 March 2015". Companies House. Retrieved 21 March 2016. ^ "Annual report 2006/7" (PDF). Royal Collection Trust. Archived from the original (PDF) on 1 April 2016. Cahill, Kevin (2001). Who owns Britain. Canongate. ISBN 978-0-86241-912-7. Clayton, Martin; Whitaker, Lucy (2007). The Art of Italy in the Royal Collection: Renaissance & Baroque. Royal Collection Trust. ISBN 978-1-902163-29-1. Hall, Michael (2017). Art, Passion & Power: The Story of the Royal Collection. BBC Books. ISBN 978-1-785-94261-7. Hardman, Robert (2011). Our Queen. Random House. ISBN 978-1-4070-8808-2. Jackson, D. Michael (2018). The Canadian Kingdom: 150 Years of Constitutional Monarchy. Dundurn. ISBN 978-1-4597-4119-5. Lloyd, Christopher (1999). The Paintings in the Royal Collection: A Thematic Exploration. Royal Collection Enterprises. ISBN 978-1-902163-59-8. McClure, David (2015). Royal Legacy. Thistle. ISBN 191019865X. Morton, Andrew (1989). Theirs Is the Kingdom: The Wealth of the Windsors. Michael O'Mara Books. ISBN 978-0-948397-23-3. Paxman, Jeremy (2007). On Royalty. Penguin Adult. ISBN 978-0-14-101222-3. Roberts, Jane, ed. (2002). Royal Treasures: A Golden Jubilee Celebration. Royal Collection Trust. ISBN 978-1-9021-6349-9. Bird, Rufus; Clayton, Martin, eds. (2018). Charles II: Art & Power. Royal Collection Trust. ISBN 978-1-909741-44-7. Cornforth, John (1996). Queen Elizabeth the Queen Mother at Clarence House. Michael Joseph. ISBN 978-0-7181-4191-2. MacGregor, Arthur, ed. (1989). The Late King's Goods. Alistair McAlpine. ISBN 978-0-19-920171-6. Millar, Oliver (1977). The Queen's Pictures. Weidenfeld & Nicolson. ISBN 978-0-297-77267-5. Parissien, Steven (2001). George IV: The Grand Entertainment. John Murray. ISBN 978-0-7195-5652-4. Plumb, J. H.; Wheldon, Huw (1977). Royal Heritage: The Story of Britain's Royal Builders and Collectors. BBC Books. ISBN 978-0-563-17082-2. Roberts, Jane, ed. (2004). George III and Queen Charlotte: Patronage, Collecting and Court Taste. Royal Collection Trust. ISBN 978-1-9021-6373-4. Roberts, Jane (2008). Treasures: The Royal Collection. Royal Collection Trust. ISBN 978-1-905-68606-3. Rumberg, Per; Shawe-Taylor, Desmond, eds. (2017). Charles I: King and Collector. Royal Academy of Arts. ISBN 978-1-910350-67-6. Shawe-Taylor, Desmond, ed. (2014). The First Georgians: Art & Monarchy, 1714–1760. Royal Collection Trust. ISBN 978-1-905686-79-7. Wikimedia Commons has media related to the Royal Collection.